Hello! I'm hoping someone help me create a cutesy golem sprite for my project?Resource Type: Overworld Character SpriteMaker Format: VxAce (although MV is fine too)Art Style: RTP (Chibi) styleDescription: I'm hoping to create a magical-looking golem, something that looks kinda rugged/worn down, but still kinda cutesy. I have an image below to base it on.References: I'm looking to have the golem based on this little guy:Very cute indeed!~Thank you! From left to right. Mira, Sphinx, Karin, Karen, Cecila, Lexar, Mai, Otama, Rira, Rose, Micaela. Hello ! I am using RPG Maker VX Ace and there is what I want to do : I would like to make an event, where the sprite, assigned to this event, has a "talking animation" which is playing until the text of a message has finished to appear. I did two versions of my sprite : one normal and one which talks. How can I proceed ? Thanks in advance. The base for Pucho Chileno. My spriter will soon add plenty of variant outfits on the character, for at least a full page of sprites to be used in the game. Sprite courtesy of user Chaokobon from the FFC fandom Discord server. Hello! I am in need of an RMXP hairstyle for Tord. I can sprite clothing, but my hairstyles don't work. While I'll be using this for a VXA game, I fellt it'd be easier to say XP, since I'm using XP sprites. I need this pretty ASAP, but I haven't been about to get what I need. :/ A turn-around for Tord, so you can see his hair from all the angles. What my sprites for the game look like. If you help, I won't be able to pay you, but I'll credit you and put you in the game as an NPC (whether you're a ghost, part of the Red Army, run a shop or are just a very basic NPC is up to you.) Thank you in advance! Hello! If possible, could someone help me create a cute little birdy creature for my game? Resource Type: Overworld character sprite Maker Format: VxAce Art Style: RTP (Chibi) style Description: I'd like to make an adorable bird monster. I have a battler sprite for it, posted below. References: Here's the battler sprite: Thank you! I've had trouble finding dragon sprites i use for my characters, the ones I have found are kinda generic and bland. My game has nearly every character, npc and otherwise, as dragons, so the lack of availability hots pretty hard. I've searched through as many resource sites I could find, and not found anything that suits my needs, so I was hoping either: -Someone could supply me with character generator resources that create dragon sprites, such as a body template. <-- (Preferable) or -Someone could edit existing dragon sprites so they resemble sprites similar to teh Actor RTP sprites included. My pixel art skills are, for lack of a better word, terrible, and I would appreciate a nod in the right direction. I'm working on a game in which the main character loses her memory and gets it back throughout the game through flashbacks. Some of these flashbacks go back to her childhood so I was wondering if anybody might be willing to make a child sprite and child faceset(s) for her? If you're interested reply to this post with a sample of your work (it can be anything) and your terms and conditions. From there, if I like it, we can privately message each other and work out the details. Much appreciated! I will also post her sprite and one of her facesets so give you an idea of what she looks like, as well. Thanks! 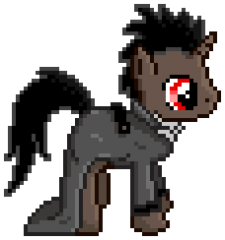 This pixel pony was made for "Making Christmas Merrier V - Charity: Water", hosted by Poniverse. I've decided, that I'll help the charity grow, by drawing ponies (including OC's) on requests for ones, who donated. Saffron Shadow is an Original Character and belongs to Dark Horse. © Â©2017 Rikifive | Saffron Shadow belongs to Dark Horse | My Little Pony: Friendship is Magic and all related characters belong to Hasbro and DHX Media. This pixel pony was made for "Making Christmas Merrier V - Charity: Water", hosted by Poniverse. I've decided, that I'll help the charity grow, by drawing ponies (including OC's) on requests for ones, who donated. Terse Tranquility is an Original Character and belongs to Fresh Nonsense. © Â©2017 Rikifive | Terse Tranquility belongs to Fresh Nonsense | My Little Pony: Friendship is Magic and all related characters belong to Hasbro and DHX Media. Cupid Strike is an Original Character and belongs to Lightwing. © Â©2017 Rikifive | Cupid Strike belongs to Lightwing | My Little Pony: Friendship is Magic and all related characters belong to Hasbro and DHX Media. Pixel Idle Animation of Twilight Sparkle. © Â©2017 Rikifive | My Little Pony: Friendship is Magic and all related characters belong to Hasbro and DHX Media. Scribere Iceberg is an Original Character and belongs to JonasDarkmane. Randi Maxis is an Original Character and belongs to Randimaxis. © Â©2017 Rikifive | Randi Maxis belongs to Randimaxis | My Little Pony: Friendship is Magic and all related characters belong to Hasbro and DHX Media. Seraphic Amity is an Original Character and belongs to Jeric. © Â©2017 Rikifive | Seraphic Amity belongs to Jeric | My Little Pony: Friendship is Magic and all related characters belong to Hasbro and DHX Media.